This painting is 'Prometheus.' 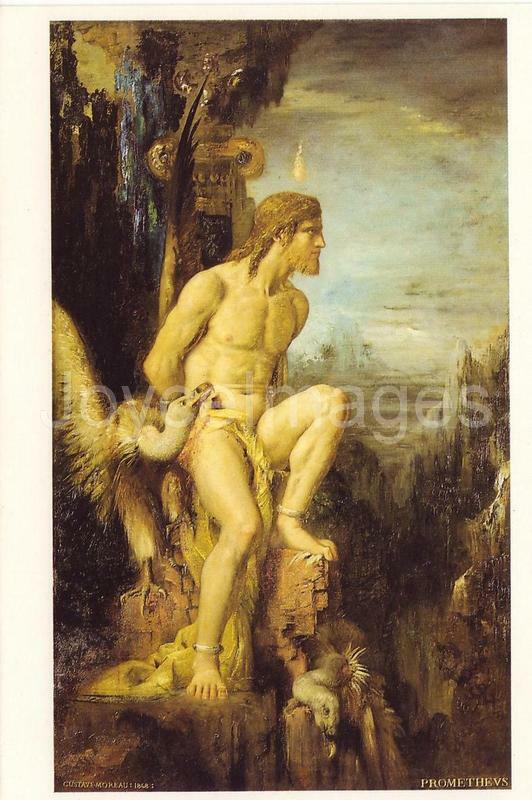 'Oedipus and the Sphinx,' one of Moreau's first symbolist paintings was exhibited at the Salon of 1864. In 1891, Moreau became professor at l'Ecole des Beaux-Arts of Paris, and counted among his many students the fauvist painters Henri Matisse and Georges Rouault. He is buried in Paris at the Cimetierre de Montmartre. Over his lifetime Moreau created over 8000 paintings, watercolors and drawings, many of which are now in the Musée Gustave Moreau at 14, rue de la Rochefoucauld (9e) in Paris. The museum is in his former workshop, and opened to the public in 1903. It is one of the nicest museums in Paris, jam-packed with his works. That's where I got these postcards.